JOIN US ON WEDNESDAY 26th OF SEPTEMBER AT 9AM FOR A 2 HOUR DESIGNER, DEMONSTRATION AND INSTALLER WORKSHOP HERE AT THE YARD. PLACES STRICTLY LIMITED TO 25 PEOPLE FOR THE DAY SO BE QUICK TO RESERVE YOUR PLACE FOR THE EVENT. learn how to pitch to their own clients about the possibilities and the benefits of working with steel. better understand life span and the do’s and don’ts of working with corten steel. see what details count in a ‘Live landscape project under construction’ and how this relates to drafting a design. have the chance to pose engineering questions to Joeri, the engineer in the Straightcurve team. observe firsthand the versatility of Straightcurve because it doesn’t require machine shaping prior to delivery! 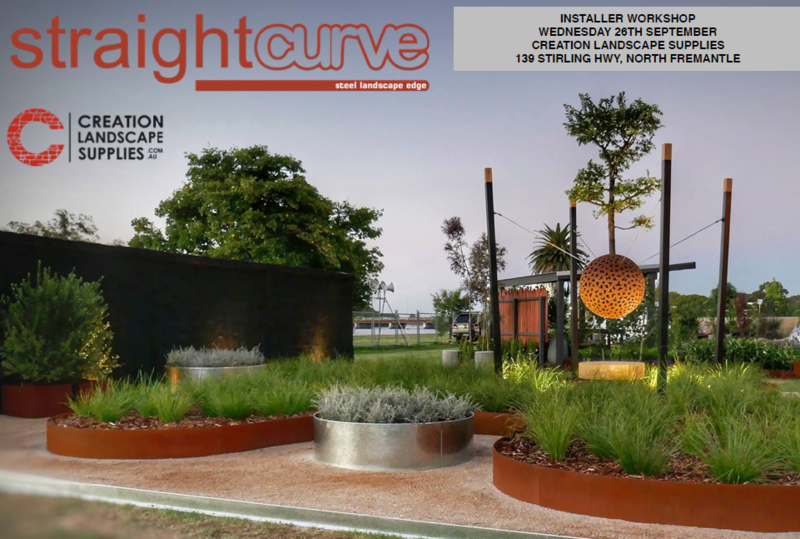 get ideas on how to incorporate Straightcurve in their designs and share some inspiration among peers/friends. learn about height changes for more dramatic landscapes – see it happening in our new display. be some of the first people to see our new display space coming together! WE’RE EXPECTING A STRONG RESPONSE TO THIS WORKSHOP SO PLACES RESERVED ONLY VIA EMAIL CONFIRMATION. HOPE TO SEE YOU THERE. CALL NICK OR JOHN AT THE YARD FOR MORE INFO. 9335 7383. LIGHT REFRESHMENTS PROVIDED.